Have you ever wondered what goes on inside the head of an international football coach? If so, the invitation to take a look at the inner workings of Italian Robert Donadoni's brain was simply too good an opportunity to pass up. Donadoni came to England in April as a guest lecturer at London's Birkbeck University and in between lunching with England coach Fabio Capello and his speaking engagement, he underwent a state-of-the-art brain scan. The Italian coach had agreed to be a guinea pig for Birkbeck and University College London's research programme into the perception of motion, a skill that may be particularly acute in athletes and especially coaches involved in team-based sports. Shown two different stimuli - a kicking and a bowling image - the experiment demonstrated that there was more activity in Donadoni's brain as regards the first picture. So with Euro 2008 so close, how would Donadoni describe the Italian football brain? "For the Italian one, the history of Italian football speaks quite clearly," Donadoni told BBC Sport over a cup of tea, referencing the Azzurri's four World Cup titles. "But history teaches us it's always dfficult to maintain a continuity when one keeps winning." It was the first of many diplomatic, not to say enigmatic, answers Donadoni delivered over the course of the day. Watching him at close quarters he is clearly an extremely canny operator, much like any Italian football coach. Despite spending a couple of years in America at the end of his playing career he insisted on speaking through an interpreter, though his understanding of English appears excellent and on a couple of occasions he answered questions fluently in English. He is serious, but also has a sense of humour. Asked to give his thoughts on the Premier League's 39th-game idea he smiles wryly as he replies - "business is business". Donadoni's playing career ended eight years ago, but he still looks every inch the player that was a key component in an AC Milan team that, in his tenure, won six Serie A titles and three European Cups. With a tie so elaborately knotted Harry Houdini might have problems unravelling it and a goatee so immaculately trimmed he looks like he employs tweezers for the job, Donadoni's appearance is of a man that pays attention to the small details. And as a coach he is as equally interested in the psychological as well as the technical preparation of his team. "When you're a club coach it's like being with your family and understanding them and developing them," he said as he outlined his management style. "But when you see people only one or two months then the pressures are increased and it's not the same kind of relationship that you develop. "It's important the players are mentally refreshed and not to put too much pressure on them - not to create a circle of negativity. We don't have a lot of time to work physically so the mental preparation is very important. Whenever I have interviewed a player from abroad they have invariably been more articulate and more analytical than their English counterparts. "It's key to shift responsibilities from their shoulders to my shoulders. My wish is to see a team that enjoys playing." Prior to the tournament starting, Italian referees' chief and former top official Pierluigi Collina warned the Italian players to avoid dangerous tackles, diving and insulting the referee next month. But would Donadoni himself be having a quiet word with Marco Materazzi, bete noire of Zinedine Zidane in 2006 and whose sending off against Liverpool fatally derailed Inter Milan's Champions League bid earlier this season? "By all means," said Donadoni. "There is the personal relationship which must be developed - it is beyond the technical. We are firstly human beings and then footballers. "Each individual player is responsbile for their own behaviour and they should control that and as coaches we should lead by example and behave. Because the example comes from above and if we are not a good example..."
Donadoni's hair is heavily spreckled with grey, but that is the only outward sign that the task of managing the Italian team might be a stressful job. "I try to lead as normal a life as possible," he says as he reflects on the last two years. "I'm aware of my responsibilities, but I try to deal with them in the most normal way." If his compatriot Fabio Capello has the "impossible job" with England, how best to describe the task of Donadoni, taking over a team that had just claimed a fourth World Cup triumph in 2006 under former coach Marcello Lippi? Donadoni himself calls it a "difficult mission", which is something of an understatement given the complexities of Italian football politics. The 44-year-old Donadoni was a surprise choice as Italy continued to be buffeted, despite their World Cup win, by the Calciopoli scandal, in which former Juventus director Luciano Moggi was accused of being at the centre of a network which tried to manipulate matches in favour of the bigger clubs. Prior to his appointment, Donadoni's managerial career, though on an upward curve, could best be described as low key. While playing contemporary Roberto Mancini got big jobs like Lazio, Fiorentina and Inter Milan, Donadoni had a tougher ascent up the Italian football ladder, guiding Livorno to promotion in 2002. He then went to Genoa, before returning to Livorno, leading the club to a surprise ninth-place finish. Midway through the 2005-2006 season he resigned over criticism from club chairman Aldo Spinelli. Given those relatively modest successes and that Italy had usually turned to coaches from inside the Federation, such as Cesare Maldini, or successful club bosses like Lippi or Giovanni Trapattoni, Donadoni very much came up on the rails in taking over from Lippi. 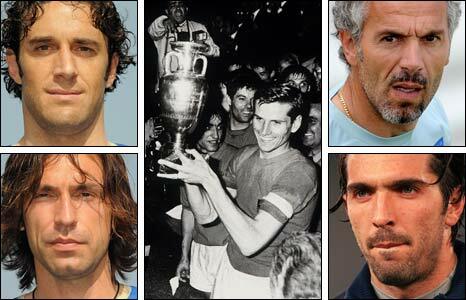 But if his coaching career was in its infancy, Donadoni certainly had two things going for him. He was untouched by Calciopoli and he was appointed by Guido Rossi, the emergency commissioner who had taken charge of the Italian Football Federation (IFF). In effect an outsider appointing an outsider. "Donadoni would never have been appointed in the normal process," said Italian historian John Foot, author of Calcio, a history of Italian football. "But he's in a very weak position. There's an Italian phrase - 'You need saints in paradise' - in other words the knack of having friends in high places and I'm not sure he has that." And while Capello happily accepted the FA's stipulation that he must get England to either a World Cup or European Championship semi-final in the next four years, Donadoni initally refused to sign the IFF's offer of a performance-related contract. Widely assumed that the deal was based on getting Italy to the last four of Euro 2008, Donadoni finally agreed to the contract's terms and is expecetd to sign over the next few days..
"There isn't a problem and I don't think too much time should be spent on this," said Donadoni of his Italy contract. "The most important thing is my job and working with the team and everything else is exterior." But with Lippi lurking in the background - the World Cup winner has not worked since Italy's success in 2006 - there is a feeling the silver-haired coach will replace Donadoni for the start of the 2010 World Cup qualifying campaign. Lippi has been assiduously preparing the ground for such a return by giving a series of interviews over the last few days, saying he is only interested in coaching Italy or Juventus. Though Donadoni could yet throw a spanner in the works if Italy were to win on the 40th anniversary of their sole European Championship success in 1968. "If Italy win that puts the Federation in a very difficult position because they can't sack him," said Foot. Donadoni, ever watchful to the very end of the interview, refuses to be drawn on how well he thinks Italy - without injured captain Fabio Cannavaro - will do at Euro 2008. "I can't predict the future, but Italy will keep giving their utmost. We qualified with difficult teams and we will try to be serious and professional." A body of words that almost sum up Donadoni himself.